My son has gone through his favorites, first it was Finding Nemo, then Cars, then Cars Toons and now it is Ratatouille. My favorite too. :) A rat cooking in the kitchen would have never sounded cute to me, but Remy the rat has my heart. The restaurant in the movie is Gusteau’s, a French restaurant in Paris. Chef Gusteau’s motto was, “Anyone can cook.” While at first Remy does not agree with Gusteau, he comes to realize what Gusteau meant – “Not everyone can become a great artist, but a great artist can come from anywhere.” Beautiful message and so true. I know this has nothing to do with meatballs, I have just seen the movie 3 times this weekend – so it’s been on my brain. :) Happy Monday y’all! I have almost given up on beef meatballs. Today they are pork or a blend of pork and beef. The addition of the pork adds so much more texture and flavor to meatballs. Your blend here of tomatoes and garlic is no doubt tasty. I will need to try-thanks for sharing. Great post and recipe. Love meatballs. What a great post! I love watching Ratatoulle with my kids, and having them get excited about food. The meatballs look wonderfully juicy too! 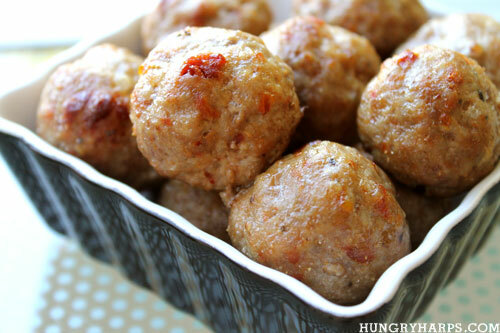 Love the idea of pork meatballs, will definately give this a try! New follower thanks to your Dad (running friend)!! Yum! These look great. Just found your blog and I love it! The meatballs look amazing and I LOVE that movie! It was the first movie I ever saw that understood who I was. I went with my fellow foodie friend!